When you first learn complex numbers, you find out that they give you ways to solve equations that were previously unsolvable. The classic example is the equation equation x^2 + 1 = 0, which if you’re only using real numbers has no solutions, but with complex numbers has the solutions x=i and x=-i. As someone who likes to imagine the physical reality of everything, this has always caused me considerable difficulties. The equation x^2 + 1 = 0 can be thought of as the equation that tells you where the parabola with equation y = x^2 + 1 meets the x-axis. Only the parabola with equation y = x^2 +1 doesn’t meet the x-axis. 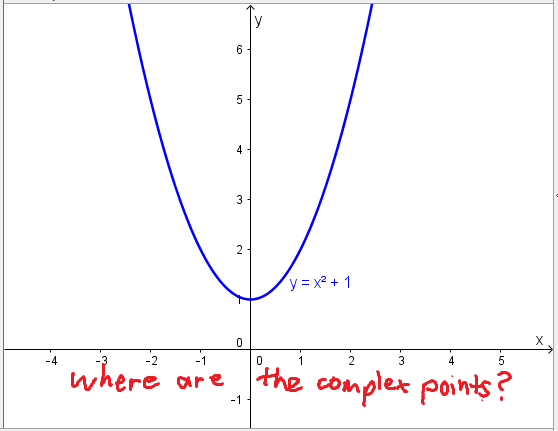 If our complex number solutions are to be believed, then it meets the x-axis in the points (i,0) and (-i,0), but I certainly can’t see those points on my graph. Where are they? Presumably there are a whole host of points with complex coordinates, which are points where various things meet that don’t look like they meet. These points must be somewhere, and they must be some place that is somehow related to the graphs I see in the real plane. But where is this place? Well, about a week ago, I finally found the place where the complex points are! Here’s the idea: at every point in the real plane, there are a real-plane’s-worth of complex points attached. The complex points attached to the real point (a,b) are all of the form (a+ci,b+di). That is, the real parts of the two coordinates are (a,b). I imagine them as a plane, with x-axis showing what imaginary part we’ve added to the x-coordinate, and y-axis showing what imaginary part we’ve added to the y-coordinate.The real point itself is in the centre of this plane. I’m going to call this plane attached to the point (a,b) the “iplane at (a,b)”. In the picture above, I’ve shown a few points in the iplane at (3,2). I’ve coloured it pink so you can tell it’s not the ordinary real plane, which as you saw above, I usually colour in white. And that’s where the complex points are. The complex point (3+i,5-2i) is in the iplane attached to the real point (3,5); the complex point (2i, -6+7i) is in the iplane attached to the real point (0,-6); and the complex points (i,0) and (-i,0) are both in the iplane attached to the real point (0,0). It’s easier to see them if you spread the appropriate iplane out and flatten it so it sits on top of the real plane. You don’t want to do the whole plane of course; you just want a big enough slice so that you can see where the point is that you want. Also, I imagine the iplane being transparent so you can see the real plane through it — hence the cellophane in all the photos of the physical models. In the below picture, a slice of the iplane at (0,0) is being flattened out to show the points (i,0) and (-i,0). 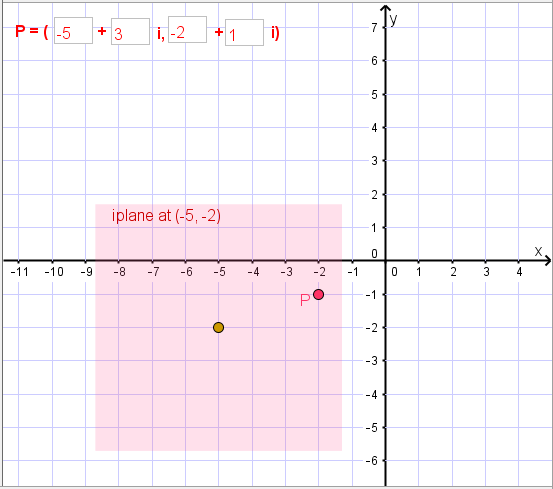 This GeoGebra applet allows you to enter the coordinates of a complex point and it will show you the iplane it’s in and the real point where the iplane is attached. Give it a go to get a feel for what’s happening here. So why am i so very very excited by this idea? Well, it all has to do with what happens when you figure out the complex points that are part of some familiar graphs. 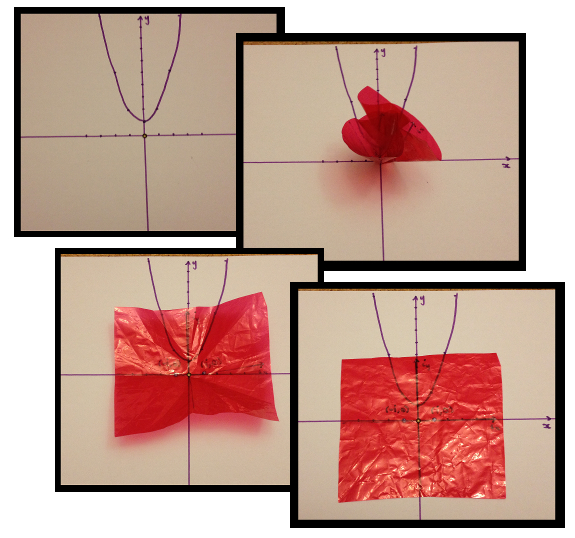 So far, I’ve thought a lot about lines and a bit about parabolas. It will take me a while to write about it all, so I’ll save those topics for the subsequent blog posts. This entry was posted in Isn't maths cool?, Thoughts about maths thinking and tagged complex numbers, iplanes, maths. Bookmark the permalink. When I saw “the biggest maths idea I’ve ever had” I didn’t think I had a prayer of understanding it. That I do is a testament to your understanding of the problem and solution and your ability to articulate it so clearly. This post inspired a lot of thoughts that I tried to condense into something coherent here. I look at your “biggest idea ever” through the lens of the Standards for Mathematical Practice we use in the states k-12. 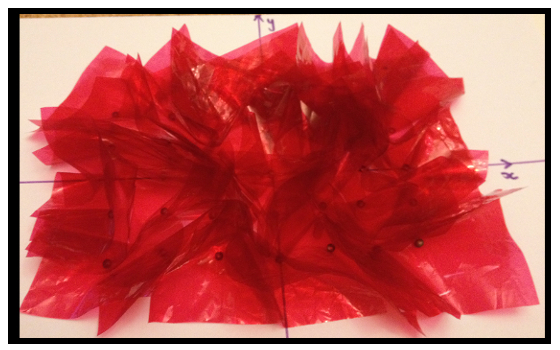 The broader ideas are looking at and contrasting what mathematicians (like you!) do and what school mathematics is often like. You’ve invented a way of visualizing R^4 by attaching an R^2 to each point of R^2, so in some sense the tangent bundle of R^2. It’s pretty neat, though, how you’ve made it concrete! I’ve never known what a tangent bundle is before now, so I’m glad if I ever look into it more closely I will have something to work from! An alternative to understanding functions (of either real or complex variable) is to use mapping diagrams. For quadratic functions (with either real or complex coefficients) the roots of the quadratic equations are visualized by arrow(s) from point(s) in the source complex plane to the point 0+0i in the target plane. 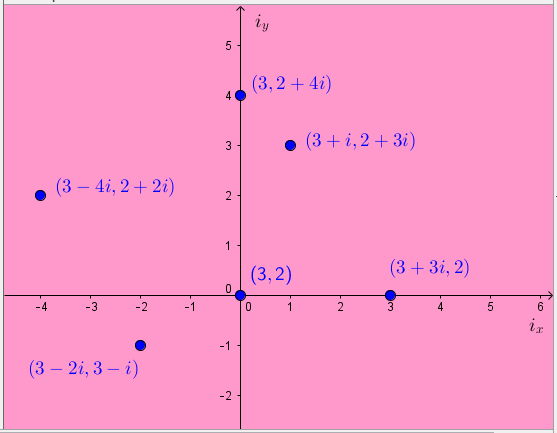 See for example my work with GeoGebra https://www.geogebra.org/m/JZYgq4Mx#material/aYeGJpS4 and MD to visualize solving linear and quadratic equations in https://www.geogebra.org/m/CX32kuXG#chapter/274869. Yes I am aware of this sort of thing and it’s an extremely useful way to think about things. I find it especially useful for derivatives. Thanks for sharing!